I was staring at a photo of a generation two Fritz that was embedded in a Craig’s List posting. Its fall board revealed an impressive array of calligraphic German proper nouns: “Johann Fritz in Gratz-Auszeichnung aus Munchen, 1854,” a fancier identity than my beloved Fritz Sohn had. But if this builder was the real deal “Johann Fritz,” a famous maker of Forte pianos, then there was cause to celebrate. I stared at the Fritz look-alike, re-incarnation of itself, admiring the magnificent contours of an ornate piano that could spark my impulsive middle-of-the-night journey to the location where the exotic instrument was housed. If I wasn’t careful, I might act impetuously against my own best interests. It was 4 o’clock on a Thursday morning, when I felt the effects of sleep deprivation from a long night of Googling, but I managed to squeeze out an extra grain of energy to research this “new” Fritz that had entered my life. 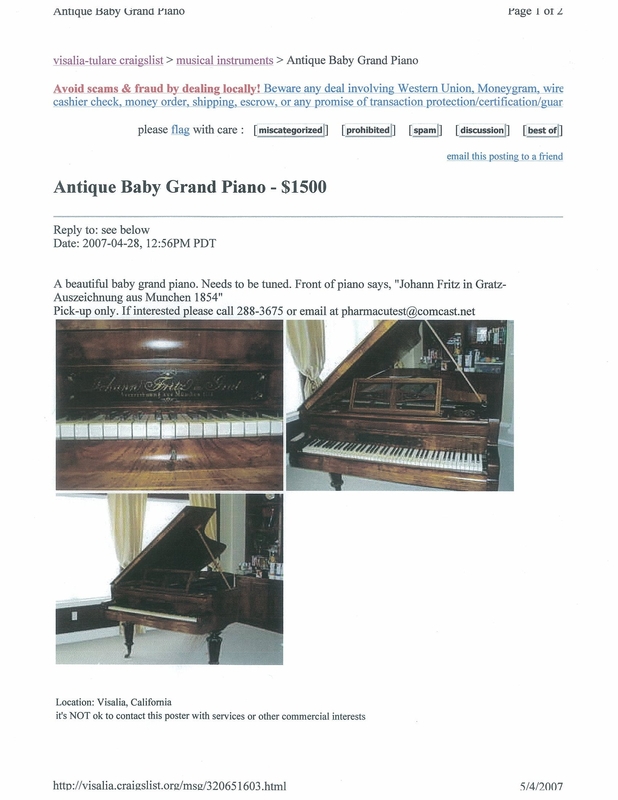 I started the day by planning to phone the seller about her advertised piano. From a Google telephone, name-link search, I ascertained her to be “Roanne Biglione,” an individual supposedly tied to a national ice hockey organization with a network of youth programs. Upon re-examination, I realized that the name was properly spelled “Roann Biglion” without the inserted “e’s” and when I did further Googling, I discovered the woman was an interior decorator. After rounds of telephone tag, busy signals, and call-waiting episodes, we finally found ourselves conversing about a piano she claimed to know little about. Nonetheless, I’d done preliminary research on these exotic pianos, and prepared a whole set of pertinent questions to ask the seller. In fact, they were mounted on a clip board for easy reference. “So where did you find this piano?” I asked. “It was at a Somerset auction,” she replied. I knew that if it bobbed up and down when the sustain pedal was depressed, then it would have strong ties to the old J. Fritz Sohn piano from the Discovery thrift store. I imagined a multicolored display of glass sculptures. My precious Steinway, on the other hand, held a conspicuous pile of worn Urtext editions of Bach, Mozart, and Beethoven. That was it. I envisioned the Biglion gatherings. They would resemble the original Tupperware parties held around town, though plastic containers of different sizes were certainly no match for exotic skin care items. “So where in the living room is your piano located?” I inquired. It was troubling that she would expose her period piano to such extreme heat without a second thought. I took a closer look at my computer screen, dominated by three photos of her Johann Fritz brand piano, and she was right— the whole pedal assembly and lyre were nowhere to be found! How on earth could I have overlooked this, something so essential to all pianos? I had to be losing my mind from sleep loss. “So where is the rest of the piano?” I inquired. It was like asking about missing body parts. There was a macabre twist to this whole plot as it unfolded. The more I learned about this instrument from the seller, the less appealing it became. “So how big is the piano?” I inquired. I heard shuffling in the background. “Oh, okay, it’s what, Jim? 6 feet? No, it’s bigger, about 7 feet or more? Well, it’s almost 8 feet!” she exclaimed. I had no intention of schlepping scores of miles, if this piano had already died and couldn’t be resurrected in this lifetime or the next. I had recently seen a Chickering Square grand that was winding its way to the scrap heap for dismemberment and salvage. In any case, the moment of truth would arrive sooner than later, and no doubt it would be alarming! As I had expected, the sour-sounding Fritz coming through phone transmission, reminded me of a Kincaid piano that was shipped from New York City to the West Coast by a fireman who’d been on the front lines during 9/11. It was a sight-unseen cross-country purchase made by a young nurse who voiced no regret about the transaction. Ironically, she referred to the monstrous instrument as her “baby” as I detailed it. But even an infant’s scowl was no match for the howl this piano produced. The hammers were mangled causing multiple notes to sound at the same time. It made me so nauseated to play this butcher block that I had to wolf down a few Pepto Bismol tablets to get through the rest of the day. From what the interior decorator seller had shared with me about the Fritz, I decided that I would pass on it and never refer the piano to anyone on my client list. But since I didn’t want to hurt the owner’s feelings, I dispatched York to the location to get his second opinion. It was not an inconvenience, since he had a few tuning and moth-proofing jobs out that way. “Do you mind if my piano tuner drops over to check out your piano?” I asked the seller. Everything Winter had said made perfect sense and it conformed to the lengthy script on the fall board that mentioned Graz and Munchen. (Munich) and the year 1854. “So what do you think of pianos that are not crafted by the esteemed builders, like those that would be made by Fritz’s son and others. Do you believe this particular instrument might be a stencil or decal piano?” (A copy of an authentic brand), I asked. “Well, you need to have an open mind about it, and even if it’s a stencil, judge it on its own merit,” he answered. “Well, that’s a challenge,” he replied. Winter had been strongly influenced by the ideas of John Watson, a Conservator of Instruments at the Colonial Williamsburg Foundation in Virginia. Watson’s philosophy of restoration was embodied in a paragraph posted on Tom Winter’s website. Both embraced the principles of “Restorative Conservation”—that is, “returning an instrument to playing condition while preserving its integrity as a historical document. Pat Frederick, Director of the Frederick Collection of Historical Grand Pianos in Ashburnham, Massachusetts agreed and she’d emphasized over and again in her correspondence that a restorer could not put modern-day strings in a period instrument. 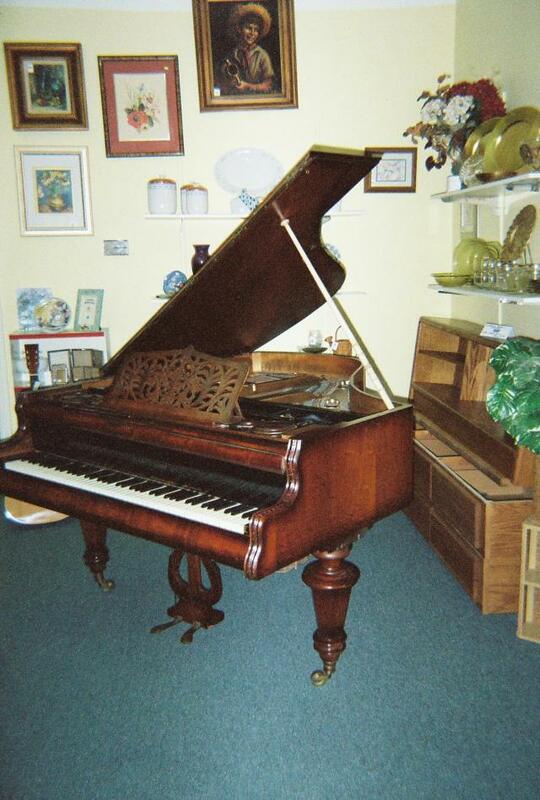 The Finchcock’s Musical Museum in Kent, England was also repository of fine, historic keyboard instruments, many of which had been sensitively restored to performance level. It was located on a picturesque Georgian Manor with 13 acres of wonderful gardens and park land. The Finchcock’s collection had over 100 historical keyboard instruments including organs, virginals, harpsichords, clavichords, and pianos, of which 40 were used in a celebrated concert series that attracted an international audience. There was one particular “Johann Fritz” Forte Piano that was housed among the others in an elegant room with hard wood flooring and period drapery. What the old man was saying corroborated what I’d heard of this piano over the phone. Land line or cell connection, it wouldn’t have made a scintilla of difference. York hadn’t been exposed to the au courant philosophy of piano restoration. Putting modern strings in a Nineteenth century period piece piano was ill-advised. Tom Winter emphasized that the carbon content of the old strings was vastly different from the modern supply. He even considered the DNA of the inner assembly in his restorations and tried to select fibers of the period. “Well that their Fritz piana aint in any playin’ condition and might as well be furniture and nothin’ else,” York said. I wondered why he hadn’t mentioned the missing lyre, pedals and all the rest. I decided not to throw a spotlight on what was obvious. There was no need to embarrass him. Otherwise, I agreed with his assessment. His appraisal had definitely saved me time and money. I’d just forget this one, and move forward in my travels without the ghost of Fritz ever to haunt me again. P.S. Several months after Fritz II died on the vine, I couldn’t resist foraging through my e-mail files for an update on the Ghost– whether it sold, was put out to pasture, or dumped, dismembered and forgotten. To my surprise, I located this communication feeding my appetite for a few chuckles. Hi Shirley, No, I haven’t sold the baby grand. It still looks beautiful and I use it to present my Arbonne Skin Care Products and also to put out Hor d’oevres when I entertain. I will be having an Open House at the end of September, looking at the 22nd, but not completely certain from 2-6 p.m. I will be featuring Arbonne International Original Hand Made Jewelry, “Rock Star Nails,” Hand Made Purses by Good Stuff and maybe Gold Canyon Candles. Let me know if you are interested in attending and I will send you an invitation. I would like to meet you and you will be able to see my piano too! Previous postPatricia Frederick’s text is provided in full where it had some missing parts in the Fritz Blog. Next postDid the Ghost of Fritz ever sell?